Though I won't need it; the weather has been glorious! I hope you have all been well and that your corner of the globe is thawing as well - if it was frozen. A new challenge starts today at Christmas at Sweet Stampin' and this time our theme is 'it's cold outside.' It is so wonderful getting ahead on Christmas cards - I hope you will join us! I wanted to make a flat card (CAS) for mailing and I challenged myself to stay away from snowflakes - seems I put them on almost every cold and snowy card. Turns out this was a lot harder than I thought. Then I finally got some inspiration from a quilt. After all, what is better than a nice warm quilt when the mercury takes a dip? You should definitely pop on over to Christmas at Sweet Stampin' for some gorgeous Christmas inspiration - the team has made a feast for your eyes! Then come join in the fun. This month we are sponsored by Yours or Mine Papercrafts who are offering a $10 voucher to one lucky winner! This is the most fabulous card ever! I love that patchwork background which showcases this cute image perfectly. Your colouring is flawless and again... I love this card! your card is amazing and coloring fabuloous!!! Thanks for joining us at CSAYL! Oh this is gorgeous!! When you look at it, you don't even realize it is CAS. Love the quilt pattern you created and your image is so adorable! Thanks for playing with CSAYL. What a perfectly adorable quilt block! Great idea. My quilting friends would absolutely LOVE getting a card like this!! Very pretty. Love the quilt design and the adorable image. Thanks for joining us at CSAYL and congrats on your win. P.S. So do you quilt fabric, too? This is such a pretty Christmas card Dawn, I love your paper choice and that sweet Miss Frosty is adorable. 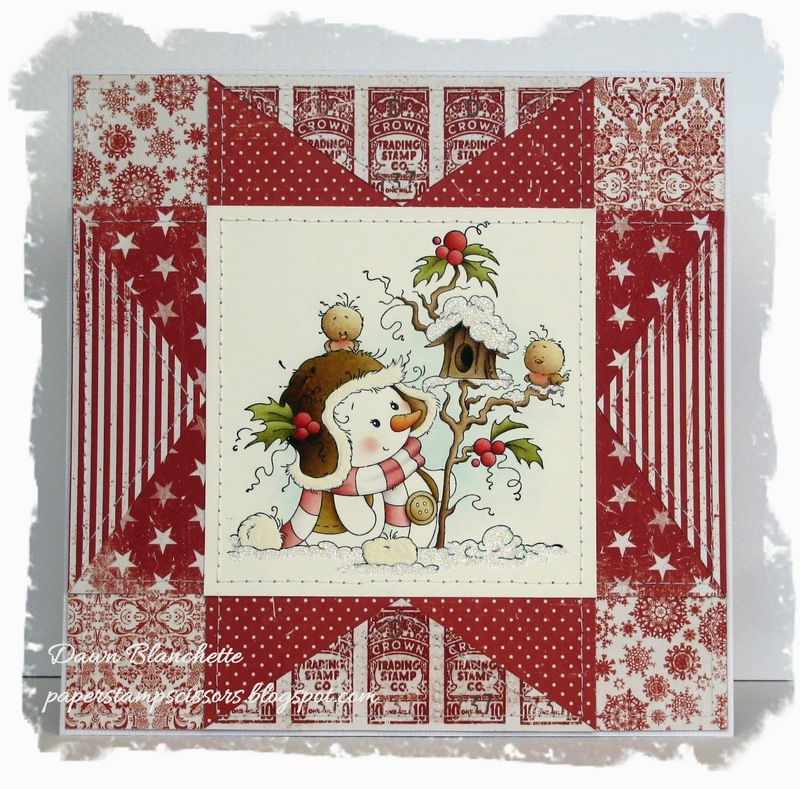 Thank you for joining us at Magnolia-licious/Wee stamps challenge. Good luck! Your card is beautiful Dawn, I love the cute image and layout. Pretty papers. A beautiful card - love the quilt background.